Adguard uses several filters to remove ads from the pages of websites. The standard program package includes a number of standard filters, but you can subscribe to any filter, if need be. Adguard filters can be configured in the Protection – Ad blocker subsection of the extended interface. Standard filter — standard language-specific filter. Depending on your computer language it could be one of English, German, Spanish, etc. 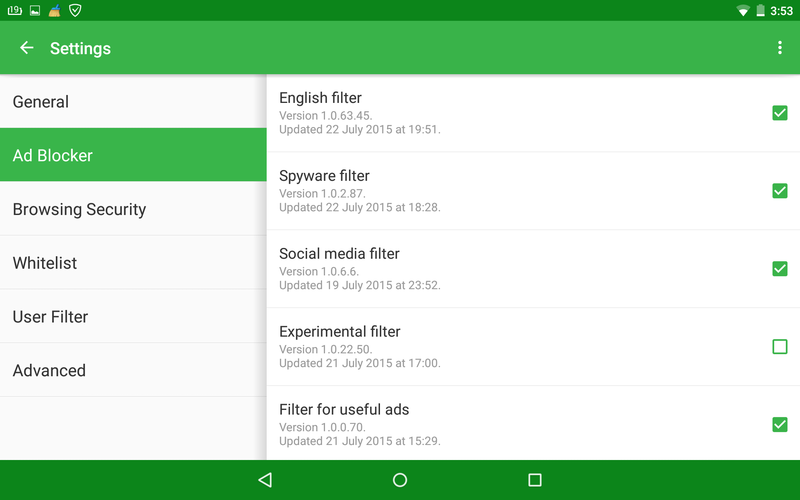 Spyware filter — the most complete list of various Internet trackers. If you don’t want to be monitored while browsing the web, subscribe to this filter. Social networks widgets filter — if you don’t like all these “Like” and “Tweet” buttons on the pages of websites, subscribe to this filter and you will never see them again. German filter — filters optimized for German online content. If you visit such websites a lot, we recommend subscribing to it. Japanese filter — filters optimized for Japanese online content. If you visit such websites a lot, we recommend subscribing to it. Dutch filter — filters optimized for Dutch online content. If you visit such websites a lot, we recommend subscribing to it. Spanish/Portuguese filter — filters optimized for Spanish/Portuguese online content. If you visit such websites a lot, we recommend subscribing to it. Russian filter — filters optimized for Russian online content. If you visit such websites a lot, we recommend subscribing to it. Experimental filter — special filter created by volunteers. Anyone can take part in creating this filter. Open-source project is available here. If Adguard missed some ads on a site, you can block them automatically – and this will not require special skills or knowledge. You can see small Adguard logo in the lower right corner of the browser window. This is a special component of the program called “Adguard Assistant”. Left-click on it and use the “Select an element” command from the popup menu. Now you need to select an unblocked banner on the page and add it to the black list. A new filtration rule will be added to “My filter” – your special user filter. If you don’t need this rule, open the program window and delete it. Unlike its counterparts, Adguard uses several blocking strategies simultaneously. This approach allows the program to completely remove all annoying ad banners from websites. This article will address all ad blocking strategies in detail. The simplest blocking strategy. Adguard blocks requests sent to prohibited addresses and sends an empty response to the browser, which basically means that requests are not sent at all. It saves traffic and reduces the page loading time. The standard filter supplied with Adguard contains over 15 thousand blacklisted addresses. But is it what we look for in a good ad blocker? Such semi-downloaded banners irritate no less than normal ones and getting rid of them is a fairly natural desire of any user. However, we won’t be able to do that if are limited to this first blocking strategy only. CSS is a special language that is used for formatting and decorating web pages. The style of page elements can be set using rules. Styles can include such parameters as colors, fonts, location and even visibility of elements. And that’s exactly what we need, since we want to hide banners. To use this mechanism, Adguard adds its own table of rules to web pages. The table consists of a large number of filtration rules capable of hiding various kinds of banners. And what about traffic economy? Don’t worry – all modern browsers will never start downloading a banner if it has been hidden via CSS. If a program supports the ad blocking strategies described above, it may be a pretty good ad blocker. But is it really enough for truly efficient ad blocking? Looks like it’s not. These methods still don’t solve the problem of partially downloaded images. And there is still the problem of “tricky” ad networks that deliver banners dynamically using scripts after the page is loaded to the user’s browser. Finally, there are sites that use special scripts protecting them from ad blockers and closing access to their content for users who have ad blockers running on their computers. Let’s take a look at the next blocking strategy. The third strategy relies on the modification of the code of a web page before it is returned to the browser. This method is unavailable to all ad blockers designed and developed as browser plug-ins. However, since Adguard is a standalone application supporting all major browsers, it can do what other products cannot. First of all, it allows us to completely remove images, links and scripts loaded from addresses on our black list. The browser won’t even know that these elements were a part of the page and will not make any attempts to load them. We have more flexibility in analyzing the elements of web pages and can remove items that cannot be normally removed even using CSS methods. As a rule, these are various scripts that cannot be disabled otherwise. Sites that rely on special scripts to prevent the use of ad blockers are a standard example that proves the importance of such analysis. These scripts deny access to the site if you are using an ad blocker. If all you have is a solution that does not support HTML content filtration, you will be forced to disable your ad blocking software or blacklist the site. Every day, tens of thousands of people fall prey to virus attacks and online fraud.